The wording on the Matzeiva refers to the fact that Rabbi Zoberman tragically drowned in the Catskills while trying to use the White Lake for Tevilla. His son is a famous Daf Yomi Maagid Shiur in Boro Park by the name of Rabbi Moshe Zoberman. My grandfather Reb Yehoshua (Oscar, Ozjasz) Schachner and Rabbi Elkanan Zoberman were the only survivors of Jordanow. 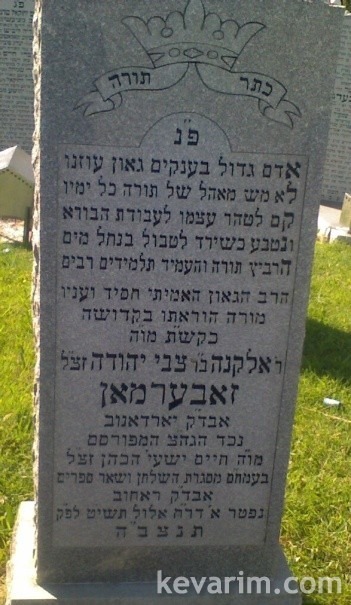 My great grandfather Reb Yitzchok Schachner was the Rosh Hakohol. There are about 100 hits on hebrewbooks.org when searching for זאבערמאן. אתה קרוב שלו או נכד שלו?? נדפסו מכתבים מאת הרב יהושע זאבערמאן למזכיר של עזרת תורה, הרב יעקב איסקאלסקי, שהיה זקני. I live in Jordanow and deals with discovering the history of the holocaust of the Jews from Jordanow. I have many pictures of the cemetery. Please see my website.